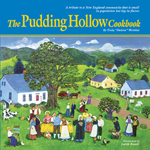 My favorite culinary event, the Pudding Hollow Pudding Festival, will return this coming Sunday, September 28, in my beloved Hawley, Massachusetts, after a five-year hiatus–an even longer hiatus if you consider the fact that the most recent festival (in 2009) took place in Charlemont, not in Hawley. Centering around a contest, the day is a whole lot of fun. Good food, good scenery, good music, and good company. A perfect combination. Free tour of nearby Sidehill Farm (a wonderful organic dairy farm, and a donor to the contest). 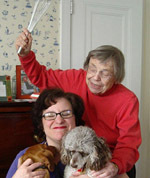 Pudding parade, entertainment, and announcement of the contest winner(s). Puddings will be available for tasting after the judging—although you eat at your own risk! Here’s a pudding to get you salivating. I was going to make it on TV last week, but we ran out of time so you see it in the video but don’t watch the preparation. 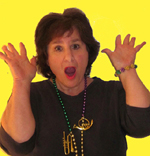 It’s simple, and a variation on it is a frequent entry in the contest. To make it more local, I used Taza Chocolate. 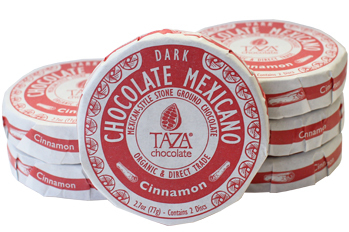 Taza is a company in Somerville, Massachusetts, that buys organic cacao beans and stone grinds them. They sent me some chocolate to play with (they also generously donated a chocolate sampler as a prize in the pudding contest) so I used their cinnamon chocolate discs to make the pudding. The recipe as it stands here is only gently chocolaty. If you are a major chocoholic, feel free to add more chocolate. And if you’d like more information about the Pudding Festival, visit its website. Preheat the oven to 350 degrees. Into a bowl sift 3/4 cup of the sugar with the flour, baking powder, and salt. Beat in the milk and vanilla. Melt the ounce of chocolate and the butter together in a double boiler. Add them to the other mixture. 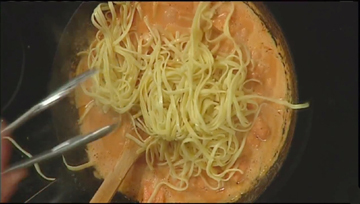 Pour this batter into a greased small 1-1/2- to 2-quart casserole dish. Blend the brown sugar, the remaining white sugar, and the grated chocolate, and sprinkle them on top of the batter. Pour the water over all. Bake for 40 minutes. Serve with whipped cream or ice cream. I had to fluff up my feathers just a little. Well, maybe a lot. 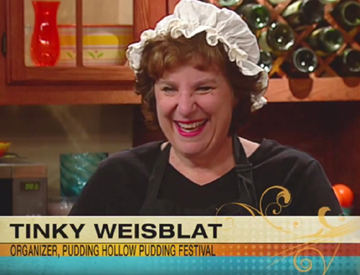 Here is my video preview of the Pudding Festival. The corn pudding recipe will come soon! I haven’t offered a giveaway on this blog in a while—so this one should be GOOD. And it is! Yummy Yammy has generously offered to send three jars of its sweet-potato salsa (one Mexican, one Moroccan, and one Tuscan) to a reader of In Our Grandmothers’ Kitchens. This company, based in Norwich, Vermont, is run by a woman named Lisa Johnson. Lisa’s salsas have no tomatoes in them, but salsa doesn’t need tomatoes. As readers may recall I have made peach salsa, tropical fruit salsa, rhubarb salsa, and apple-cranberry salsa. 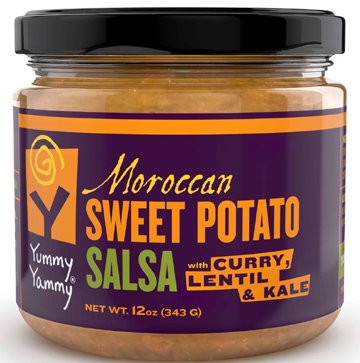 I had never thought of making salsa out of sweet potatoes, however, and I was intrigued when Yummy Yammy offered to send me some to try. Lisa’s salsa lives up to its name. It’s made of real food—sweet potatoes, beans, lime juice, vegetables, spices—and it tastes fresh and yummy. I served some at a cocktail party this week, and neighbors loved it, too. The salsa isn’t cheap. When I think of what I spend making salsa, however, I realize why. Yummy Yammy is smoother than tomato salsa, which makes it versatile. And it’s low in calories and high in nutrition. Yummy Yammy is available in the North Atlantic region at Whole Foods Market as well as online at Amazon and Open Sky. If you don’t win the salsa giveaway (I wish you ALL could! ), you can go to the Yummy Yammy website and sign up for its mailing list. You will receive free shipping on your first online order as well as special offers in the future. To enter the drawing for the giveaway, just leave a comment below telling me about your favorite salsa or your favorite thing to do with salsa (or whatever you feel like discussing!) between now and midnight on the morning of Tuesday, September 16. I’ll choose a winner randomly and announce his/her name on the morning of the 17th. Good luck—and just in case you were dying to see me in a new straw hat (I KNOW you were! 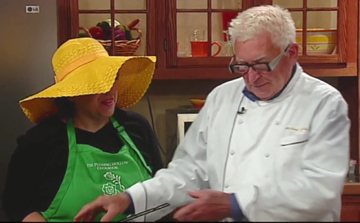 ), here is my most recent TV appearance. The recipe I make comes from my upcoming book on Funeral Foods and is based on a dish in a mystery novel by Margaret Maron. Just click on the picture below to watch. 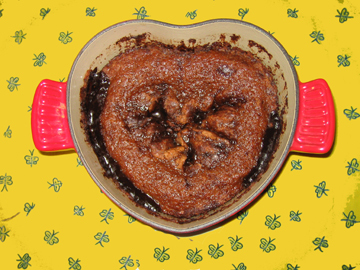 And if you make the actual recipe depicted (I encourage you to do so! ), bake the casserole until the biscuits brown (about 20 minutes) and then cover the whole thing and bake for 10 to 20 minutes longer to make sure everything is warm and bubbly. Enjoy the glorious almost fall weather….